Cattle on feed up 4% from a year ago. The U.S. Department of Agriculture’s July “Cattle on Feed” report may not have been full of surprises, but it certainly provided one large one: Pre-report estimates had suggested a 6% increase in placements during the month of June, but USDA reported a 16% increase. 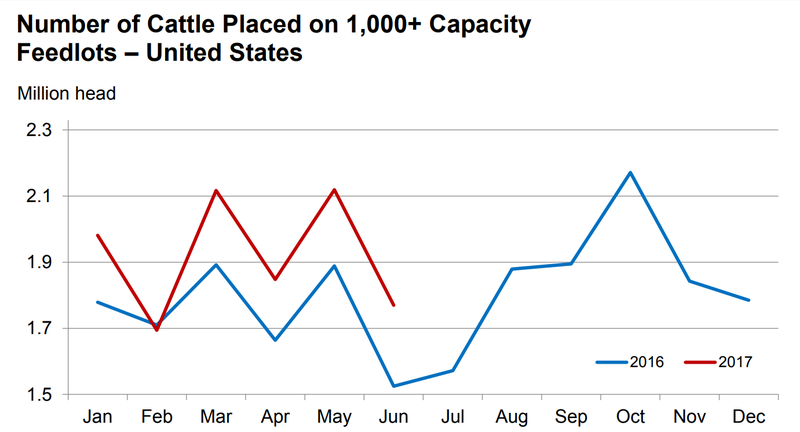 Cattle and calves on feed for the slaughter market in the U.S. for feedlots with a capacity of 1,000 head or more totaled 10.8 million head on July 1, 2017. 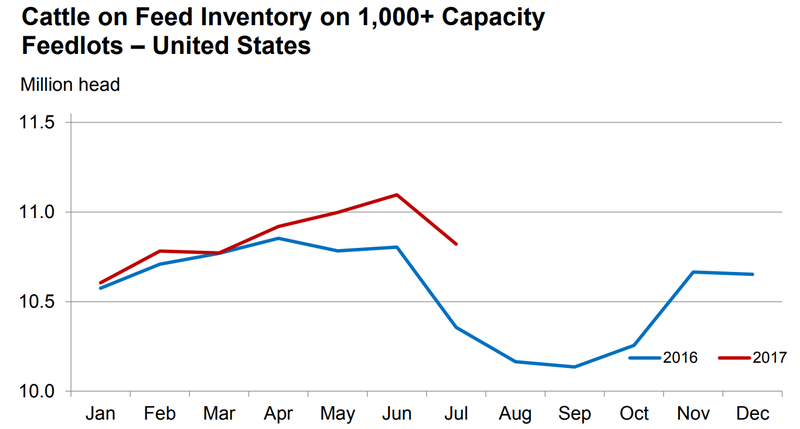 The inventory was 4% above the same period last year and in line with analysts’ expectations. The inventory included 6.96 million steers and steer calves, up 1% from the previous year. This group accounted for 64% of the total inventory. Heifers and heifer calves accounted for 3.86 million head, up 11% from 2016. Placements totaled 1.77 million head, with net placements at 1.71 million head. During June, placements were 375,000 head for cattle and calves weighing less than 600 lb. , 315,000 head for those weighing 600-699 lb., 430,000 head for 700-799 lb., 385,000 head for 800-899 lb., 170,000 head for 900-999 lb. and 95,000 head for 1,000 lb.-plus. Marketings of fed cattle during June totaled 1.99 million head, 4% above 2016 and fairly close to pre-report estimates. Other disappearance totaled 56,000 head during June, 8% below 2016. Cattle and calves on feed for the slaughter market in the U.S. for all feedlots totaled 12.8 million head on July 1, 2017, up 6% from the July 1, 2015, total of 12.1 million head. Cattle on feed in feedlots with a capacity of 1,000 head or more accounted for 84.5% of the total cattle on feed on July 1, 2017. This is down 0.1% from 2015, USDA said.